Siddharta Gautama (c. 563/480 - c.483/400 BCE) attained enlightenment and became Sakyamuni Gautama Buddha, meditating under the Peepal or Fig Tree, also famously known as the "Bodhi Tree". "Bodh" (Sanskrit) means knowledge and enlightenment. As a laser artist, the greatest challenge I encountered was to transfer the narrow and piercing beam of light to serve as a harmless, painting brush in developing the serene and peaceful look that I intended on the face. 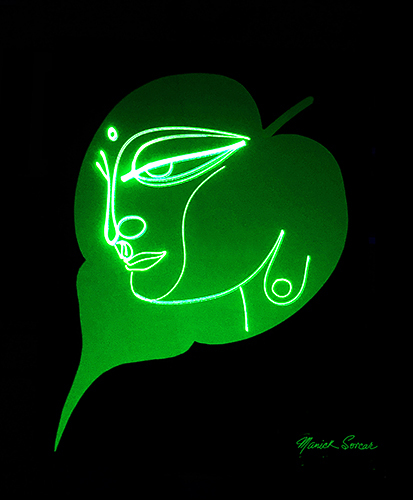 With this laser art of Lord Buddha on a Bodhi leaf, I bow down to express my 'Pranams' (respect) to Him and seek world peace. Note: The above will be one of several laser art pieces that will be projected live at Sorcar's art exhibition in September, 2018. Click "Enlightenment of Buddha" for Sorcar's earlier stage show which combined laser with live acting, and the Artistic Award it received from the International Laser Display Association, at Rimini, Italy.